Through private donations, our collective efforts will make a positive impact on food borne illness awareness. You are new to a community. 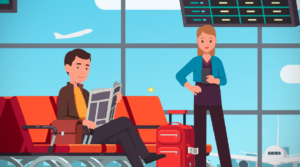 You are traveling in an unfamiliar locale. You heard that a local restaurant has some public health issues. You want to entertain guests. You would like to “Dine out with Confidence”. But where do you turn for food safety ratings? Restaurant grades are difficult to find and hard to understand. Is Food Safety Important to You? Tell us in this simple survey. Your donation to the Dining Safety Alliance Not-For-Profit will make a difference in Food Safety! 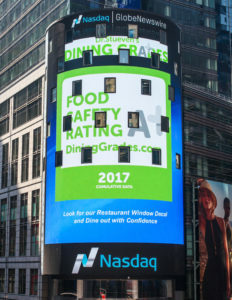 The Dining Safety Alliance funded window decal program was featured in Times Square in 2017. Thousands of restaurants in 25 major metropolitan cities were sent donor funded window decals. Those restaurants had an excellent food safety rating record and now they are recognized for all to see. Every year we identify these high achieving establishments. Donor funding supports acquiring and analyzing hundreds of thousands of health department inspections all over the USA, Canada and the UK. We now boast over 4 million ratings and over a million food establishments. 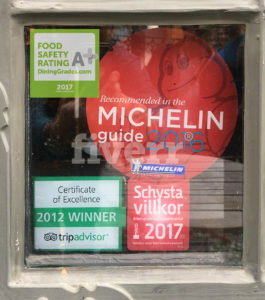 Once the high achieving restaurants are identified, donor funding further supports the cost of the the window decal and mailing. Through this initiative, we reward restaurants that have excellent food safety ratings. We honor those restaurants who have earned a 36 month cumulative average of an A grade. That is quite an achievement. A donor funded window decal recognizes their food safety excellence. Our hope is that recognizing high achievers will encourage other restaurants to strive for excellence. Further to increase awareness of food safety ratings, we fund posting of letter grades. We can agree, health department restaurant scores and grades are hard to find and understand. In a strategic partnership with DiningGrades.com, DiningSafetyAlliance.org is supporting convenient access to standardized health department scores converted to understandable letter grades. Donor funding indirectly supports this herculean effort. Help bring Food Safety ratings & grades to your community!